The Fall 2009 photo came to us courtesy of Mike Wagner, whose aunt is in the photo. Those depicted in the photo were members of the ensemble that presented the Echoes of Erin radio show on WHK from the Terminal Tower in the 1920s through ‘40s. They include (standing): Pat Patton (singer? 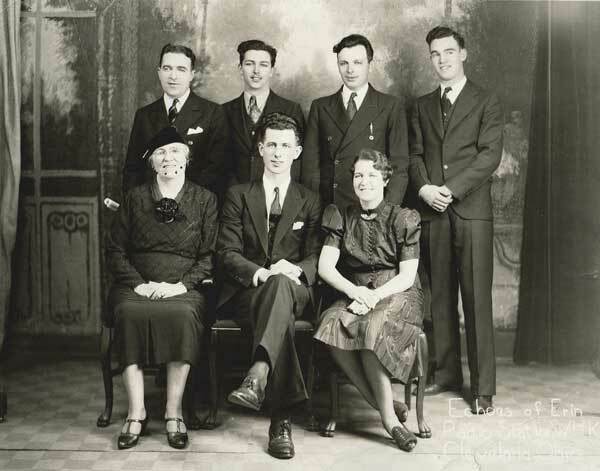 ), Carl Fotte (Engineer), Johnnie McNea (Accordion player), Frank Keating (piano) and (seated) Mary Kay Duffy (host), Jimmy Giblin (fiddle player), and Anne Patton (singer?). Thanks to Mike Wagner and John “Pat” McNea for telling us about the photo.